Jack Britten was given the name Yalatji on his birth c1920. Raised in the bush on Tickelara cattle station in the East Kimberley, he remained in the area at the community of Warnum as a senior elder and custodian of the world-renowned strikingly beautiful Bungle Bungles National Park. Among Yalatji’s earliest memories were seeing a motor vehicle for the first time and watching camel trains and their Afghan drivers transporting supplies to the outstations. A white manager of Hann Springs cattle station, Jack Britten, befriended the young Yalatji, teaching him the ways of station life and bestowing his own name onto him. Yalatji henceforth became known as Jack Britten. Jack’s local knowledge and bush survival skills were much in demand by many station managers. As a gifted horseman, Jack was highly sought after and he gained work at many East Kimberley cattle stations. Jack worked some of the last big cattle drives from Mt. Isa and Biloela in Queensland, driving herds of up to two thousand head, traversing Australia back to the Kimberley. During the wet seasons, Jack searched for gold along the Halls Creek goldfields, which he traded for tobacco, flour and blankets. Although ‘Young Jacky’ (as he preferred to be known) had been taught traditional ochre painting by his grandparents, it wasn’t until his years as a stockman were over that Jack turned to art. As part of a community, Jack met his new neighbours who included such notable artists as Queenie McKenzie, Paddy Tjamatji (Jampinji), George Mung Mung and Rover Thomas. Working alongside his new-found artist friends, Jack encountered difficulties as the canvas shrunk and buckled when the ochre was applied in hot weather. Together with the original Ochre artists, Jack stretched the unmanageable canvases onto plywood, using the natural bush gums and kangaroo blood as binders for the ochre. Today, Aboriginal artists call stretched canvas ‘painting boards’. Jack not only strove for accurate depiction through his comprehensive knowledge of the land and the Dreamtime stories of his culture; he believed that by passing down his knowledge to the next generation, the Aboriginal culture would be preserved by the dancing, singing and the stories of the paintings. 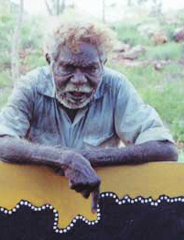 In 1982, Jack moved to Frog Hollow, forming the Wurreranginy (Frog Hollow) Community south of Turkey Creek where he painted for many years with his friends Henry Wambini and Beerbee Mungnari. Although he relocated to Turkey Creek in 2001, Jack was always referred to as ‘The old man from Frog Hollow’. Purnululu, of which he was Traditional Custodian, was the subject matter of many of his paintings. As a senior elder, his humour and riveting storytelling was legendary. Jack’s vast repertoire of the myths and legends of the gnarangani (Dreamtime) was an enduring inspiration for his visual and eloquent works. Jack Britten's works focus on the origins, ceremonies and ancestral figures of his beloved East Kimberley, merging the spiritual and physical landscape. His paintings explore the landscape with rough textures and bold designs. Distinctive dotting defines the landscape forms, illustrates the country and suggests the presence of ancestors and ceremonies. The occurrence of body markings in Jack’s work alludes to his ritual seniority. The artist’s paintings are a reflection of his spiritual and lyrical vision of and connection to the landscape. 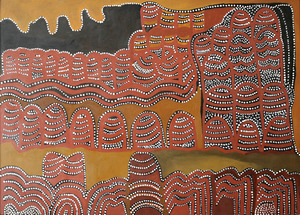 From the late 1980s onwards, Jack exhibited widely across Australia, including ‘Crossroads - Towards a new Reality’, Aboriginal Art from Australia, National Museums of Modern Art, Kyoto and Tokyo in 1992 and Images of Power, Aboriginal Art of the Kimberley, National Gallery of Victoria in 1993. 1992 saw him win the prestigious Museums and Art Galleries Award and the National Aboriginal Art Award. Jack’s work is included nationally and internationally in important private and corporate collections, including Artbank, Sydney, Art Gallery of New South Wales, Art Gallery of Western Australia, Gifu Museum, Japan, and The Kelton Foundation, Santa Monica, U.S.A.
Jack Britten passed away in July 2002. He was included in Australia’s Top 50 Most Collectable Artists 2004.